Western blot analysis of extracts from 293T cells, mock transfected (-) or transfected with a construct expressing full-length mouse AIM2 (mAIM2; +), using AIM2 Antibody (Mouse Specific). Western blot analysis of extracts from A20, J774A.1, and C2C12 cell lines using AIM2 Antibody (Mouse Specific) (upper) or β-Actin (D6A8) Rabbit mAb #8457 (lower). 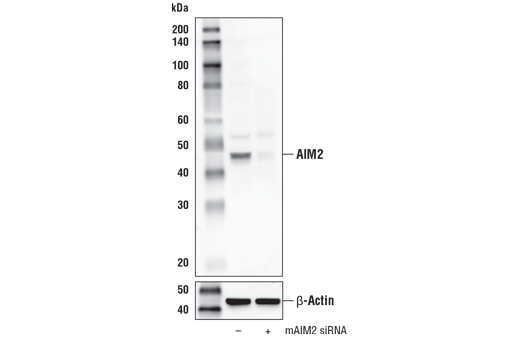 Western blot analysis of extracts from J774A.1 cells, mock transfected (-) or transfected with mouse AIM2 siRNA (mAIM siRNA; +), using AIM2 Antibody (Mouse Specific) (upper) or β-Actin (D6A8) Rabbit mAb #8457 (lower). Immunoprecipitation of mouse AIM2 from J774A.1 cell extracts. Lane 1 is 10% input, lane 2 is Normal Rabbit IgG #2729, and lane 3 is AIM2 Antibody (Mouse Specific). 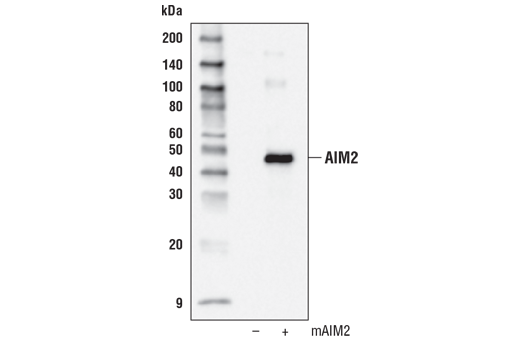 Western blot was performed using AIM2 Antibody (Mouse Specific). 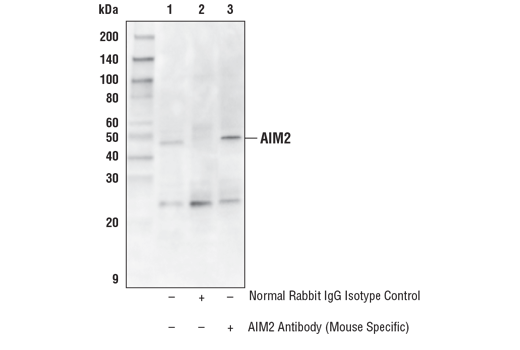 Mouse Anti-rabbit IgG (Conformation Specific) (L27A9) mAb (HRP Conjugate) #5127 was used as a secondary antibody. 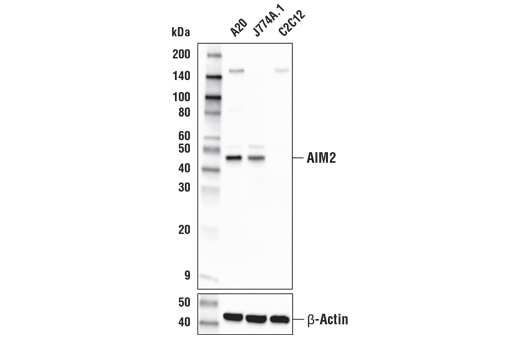 AIM2 Antibody (Mouse Specific) recognizes endogenous levels of total AIM2 protein. Polyclonal antibodies are produced by immunizing animals with a synthetic peptide corresponding to residues surrounding Val104 of mouse AIM2 protein. Antibodies are purified by protein A and peptide affinity chromatography. Absent in melanoma 2 (AIM2) is an interferon-inducible protein containing an amino-terminal pyrin domain and carboxy-terminal HIN-200 domain that functions in innate immunity and tumor progression (1). Expression of AIM2 can inhibit cell growth and tumor formation (2,3). Furthermore, the AIM2 gene has a high frequency of mutations associated with microsatellite-unstable colorectal cancers (4). AIM2 has a critical role in the activation of caspase-1, the protease responsible for the processing of pro-inflammatory cytokines IL-1β and IL-18. Caspase-1 activation is regulated by multi-protein complexes referred to as “inflammasomes” (5,6). Distinct inflammasome complexes have been described containing NLRP1/NALP1, NLRP3/NALP3, IPAF, and AIM2. The HIN-200 domain of AIM2 is responsible for binding to cytoplasmic double stranded DNA, resulting in caspase-1 activation. (7-9). This inflammasome complex also involves binding of the pyrin domain of AIM2 to the CARD-domain protein ASC/TMS1, which then interacts directly with caspase-1. As a result, AIM2 has been demonstrated to be an important sensor for a number of different pathogens (10-12). DeYoung, K.L. et al. (1997) Oncogene 15, 453-7. Chen, I.F. et al. (2006) Mol Cancer Ther 5, 1-7. Patsos, G. et al. (2010) Int J Cancer 126, 1838-49. Woerner, S.M. et al. (2007) Genes Chromosomes Cancer 46, 1080-9. Schroder, K. and Tschopp, J. (2010) Cell 140, 821-32. Khare, S. et al. (2010) Crit Rev Immunol 30, 463-87. Roberts, T.L. et al. (2009) Science 323, 1057-60. Hornung, V. et al. (2009) Nature 458, 514-8. Fernandes-Alnemri, T. et al. (2009) Nature 458, 509-13. Jones, J.W. et al. (2010) Proc Natl Acad Sci USA 107, 9771-6. Fernandes-Alnemri, T. et al. (2010) Nat Immunol 11, 385-93. Kim, S. et al. (2010) Eur J Immunol 40, 1545-51.